Following up on last week’s post on E3, there has been a number of comments about how much influence the controversy over a lack of female playable assassins in Assassin’s Creed: Unity had on the amount of coverage game received around E3. I went into our tool and created a dedicated tracker to find articles discussing the topic. Because we are not talking about the title of a game here, which is usually fairly consistent between different languages, I had to stick to a smaller subset of languages here: English, German, Spanish and French. – a tracker on Assassin’s Creed: Unity. It includes all the articles about the game. – a tracker on Asssassin’s Creed AND female characters. There are probably a few false positives in there, but considering how prevalent the topic was during that period, they should be relatively minor. There is also no indication of whether an article was factual, negative or positive. It just states the topic was brought up. So all the articles from the first tracker, also include the articles from the second tracker. For context, the Polygon article that started the discussion was published on the 11th of June (European time). On the 20th of June, Insomniac released a video showing a female avatar dressed as an assassin in Sunset Overdrive to illustrate their answer to a fan’s question on if players can play as women in the game’s multiplayer. 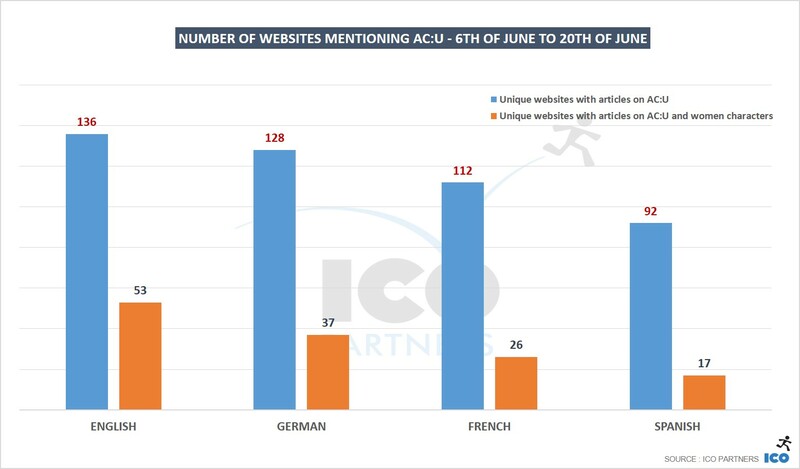 From the data, the stunt seems to have been picked up by mostly English speaking media, and to a lesser extent the German media. Clearly, the English media have treated the topic in bigger numbers. There were a higher percentage of the media covering the game that mentioned the female characters, and there were more articles per outlet on that topic as well. On all metrics, this has been a bigger discussion point for those media. I don’t have a specific conclusion that can be reached in regards to the discrepancy in coverage per language. The ecosystems in which Europe’s media are evolving are considerably different from one another. The number of outlets, output volume of the different outlets and audience profiles are all different. You also see some topics becoming more or less trendy in different regions as key influencers comment on the topic – with media from the same region then competing for attention on some topics. What the data is providing though is an indicator of the impact the controversy had in the number of total articles it generated and its overall “weight”. The comments on the E3 piece were coming mostly from English-readers working in the industry. Because of this, I suspect they got more heavily exposed to the controversy. 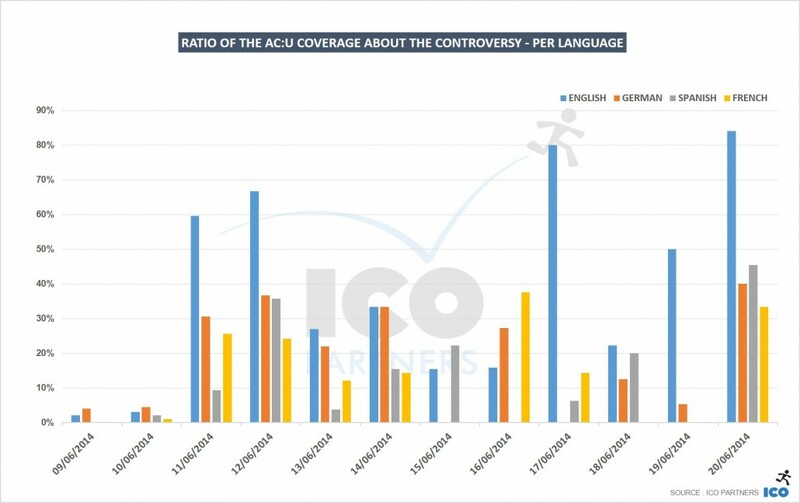 Don’t get me wrong – it had a fair share of responsibility behind the fact that AC:U was ahead of other games in the E3 media coverage – but keeping in mind that the English coverage overall was 17% (that’s including all languages we track) of all the AC:U coverage, there is a perception that doesn’t represent an accurate picture. 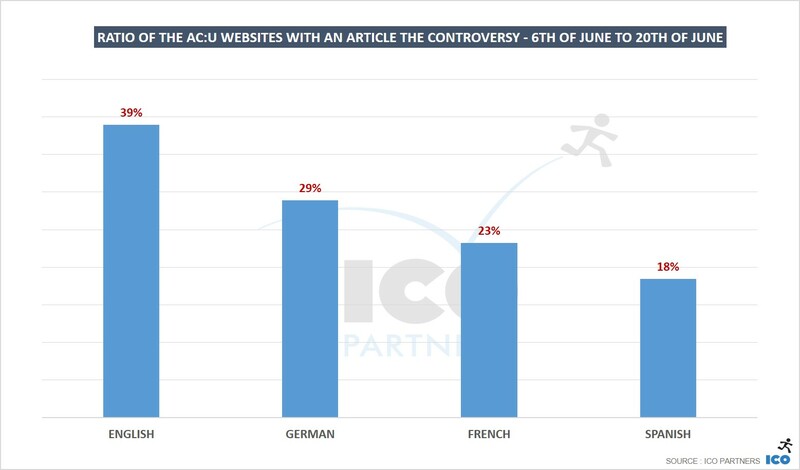 Still, even if the actual percentage of controversy articles is 15% across those for 4 languages rather the 26% seen in English, that’s still almost one article in six bringing up this one topic. And for the ones wondering, if we were pessimistic, and said about 20% of AC:U articles (as opposed to the observed 15%) were about the women characters in AC:U and they were removed, the game would still be ahead of Battlefield Hardline as the most talked about game of E3.